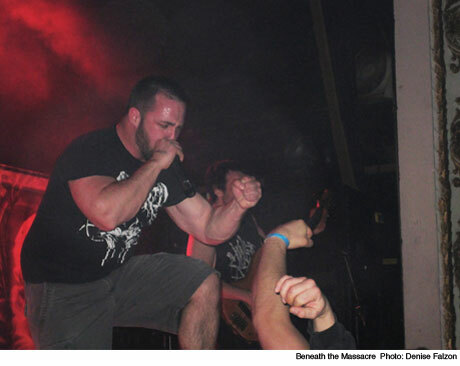 Touring in support of their latest EP Marée Noire, Montreal technical death metal outfit Beneath the Massacre stopped by Toronto for a poorly attended Montreal Metal Showcase. But in true BTM style, the band performed a powerful set with utter grit and passion. Vocalist Elliot Desgagnés delivered his incessantly guttural and commandingly brutal vocals with complete force, while the guitar work from Chris Bradley was severe and unbelievably fast throughout. Their 30-minute set comprised a mix of outstanding tracks from their discography, including "Society's Disposable Son" from their 2007 full-length Mechanics of Dysfunction and the chugging riff-heavy "Our Common Grave" off 2008's Dystopia. BTM also managed to throw in the stellar "Comforting Prejudice" from their debut EP Evidence of Inequity, providing the highlight of a perfectly executed, balanced performance.